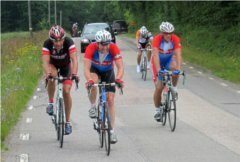 Cycling – that’s what the Hisingens Cykelklubb is doing. And we do rides. Sometimes far, sometimes burned, sometimes fast – but always enjoyable. We prioritize safety when we ride a bike, we have a number of speed groups where we drive in a group that is very social. In order for us to drive safely on our roads together, it is very important for everyone that you have participated in one of our introductions before you start cycling with us on our rounds! In this section you can read about our different types of training rounds. A number of times in autumn, but especially in the spring we have introunders for you who are unsure of how to cycle in a group. There we go peace and quiet through the basics so that you can easily follow the usual rounds next time. The age limit of our training opportunities is 18 years old, if you do not have a responsible adult who cycles with you on the whole round. We have loan bikes that you can book and ride on our motion and intro from the clubhouse if you are curious about cycling in groups but have not yet bought your own bike. The reservation is made on Facebook on the round and the principle applies is “first come first served”. Since we often stay out in traffic, we have developed a number of simple rules and signs that make us much safer and make it more fun on the roads. Read about our training policy. Since we are convinced that all cyclists are nice, please feel free to ride with us 2-3 times – whether you are a member of the club or not. Then we see you become a member if you want to continue participating in our nice round of events.